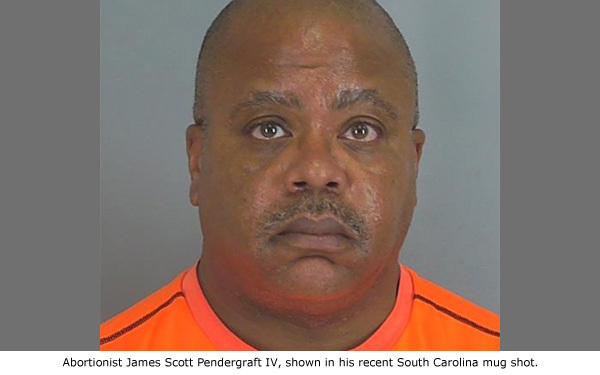 Spartanburg, SC — Florida abortionist James Scott Pendergraft IV pled guilty to ten drug counts yesterday in a Spartanburg, South Carolina County Court stemming from his arrest during a traffic stop in 2015, in which he was caught conducting an illegal abortion business out of his vehicle and in possession of illegal drugs. The ten criminal Felony and Misdemeanor counts include Possession of a Controlled Substance, Possession of Marijuana and LSD, Possession and Distribution Prescription Drugs without a Prescription, and Manufacture and Possession of Schedule I & II Substances. Pendergraft was sentenced on each charge for varying amounts of jail time up to five years, but those sentences were suspended for time served. He was placed on 5 years of probation and fined a total of $26,342.25. He was also prohibited from ever applying for a medical license in South Carolina. Pendergraft was not charged with illegal abortions or practicing medicine without a license even though he has never held a medical license in South Carolina. Pendergraft operates four abortion facilities in Florida, yet his medical license is currently under suspension for the fifth time for substandard abortion practices and failing to pay the Florida Medical Board over $122,000 in fines and fees. A felony conviction should provide ample grounds for permanent license revocation. Pendergraft also was hit in 2011 with a malpractice judgement of $11,800,000, which creditors continue to try to collect. Given his financial woes, paying the fines on his drug convictions may prove a difficult task. • EPOC Clinic, LLC in Orlando. • Ft. Lauderdale Women’s Center, LLC in Ft. Lauderdale. • Orlando Women’s Center, LLC in Orlando. • Ocala Women’s Center, LLC, an Ocala abortion facility that closed in 2015. The Florida Department of Health cited Pendergraft’s arrests as the basis for the facility license revocations. However, those abortion facilities remain open pending an appeal. Pendergraft’s convictions should be enough to shut his businesses down for good, but that determination still lies in the hands of the court. “Pendergraft truly belongs behind bars. Traditional discipline has never persuaded him to amend his criminal conduct. Even if his license is revoked and his Florida abortion businesses closed, vigilance is ever necessary, lest he take his illegal and dangerous abortions underground once again,” said Troy Newman, President of Operation Rescue. Operation Rescue has caught Pendergraft operating outside the law before. In 2012, an undercover investigation found that he was operating an illegal late-term abortion racket at an unlicensed abortion facility in Maryland with the help of abortionist Harold O. Alexander. Alexander’s medical license was temporarily suspended as a result.